Since the start of Crofton Is Kind (a project of Kindness Grows Here, Inc) in mid November of 2016 members of our group have been working to spread kindness far and wide. We’ve handed out over 300 Random Acts of Kindness (RAKs) at various places in the community (Wegman’s, Target, the MARC station). We most often do this by handing out bags of Hershey’s Hugs and Kisses with a note inside explaining what we are doing and encouraging others to find ways to spread kindness to those they know, and those they don’t. We’ve delivered cookies and donuts to the fire fighters at the local Gambrills station. We started a program at Nantucket elementary to encourage all students to commit RAKs in the community. 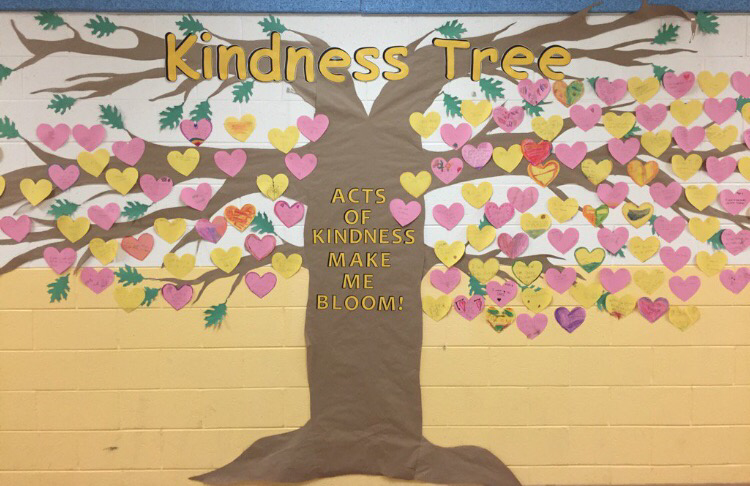 The school put up a kindness tree that “bloomed” as the kids completed their RAKs. On April 9, 2017 we cooked and delivered dinner to the Waugh Chapel Fire Station for all the crew members who were working that day. 9 families participated in providing this much appreciated meal to these much appreciated members of our community. We hosted a kindness party, that included 13 children and their parents and sought to engage the kids in thinking about creative ways to be kind to their siblings, classmates, neighbors, friends, and strangers. Every child left with a number of RAKs (Random Acts of Kindness) that they would share after leaving the party. On Saturday May 27th we held our “Kindness Rocks!” event, in which 50 people got together as a group to paint rocks with positive messages. We ended up with over 400 painted rocks! These rocks will be spread around the community (at a later date) for strangers to find with the hope that such messages will spread kindness and bring a smile to the face of the person who finds the rock! So, keep an eye out! You may just be the lucky finder of one of these beautiful rocks! Then, on July 8th we had a Park Meet-Up/Clean-Up/Rock Spreading Event at Crofton Park. This was a chance for Crofton Is Kind members to hang out, to help clean up the park, and to pick up the completely dried, sealed, and labeled rocks that had been painted at the previous event. Since then, hundreds of rocks have been spread all around Maryland from Crofton Is Kind members all with the goal of spreading kindness! Some of our projects occur on a large scale. But many are small. We are happy to support any event or project in any way we can as long as the goal is spreading kindness! If you have an idea for an event or activity and would like our support, please don’t hesitate to reach out! Thanks for visiting! We hope this page will inspire you to spread kindness in your community! Please reach out if you have ideas about how we may be able to help! And please consider donating to Kindness Grows Here by clicking the link below. By doing so you will allow us to foster kindness in children!